Despite U.S. house prices surging higher in July by 1.1% (May data) after near flat lining for several months, the mainstream pundits continue to issue warnings of its unsustainability for as is always the case there are ample snippets of data out there to take either a positive or negative point of view and since fear tends to sell more copy, so that is where approx 80% of the mainstream media's focus lies. Rather than listing a series of pronouncements from who in large part will be unknown market commentators, I will just list the utterance from from the widely recognised King of U.S. Housing market data, Prof. Robert Shiller who recently warned not just against high housing market valuations but also for bonds and stocks, a bull market which he neither saw coming and has been caught on the wrong side of for many years. So what do academics such as Robert Shiller repeatedly miss ? They miss the significance of MOMENTUM and SENTIMENT on TREND which is ACCUMULATIVE as I have covered several times over the years. So enough of the noise from ivory tower professors and pseudo-economists (journalists) who regurgitate academic theories and sales pitches from the financial industry, instead here is my real take on the current state of the U.S. housing market in terms of PRICE, for at the end of the day all that matters is what the PRICE is doing. 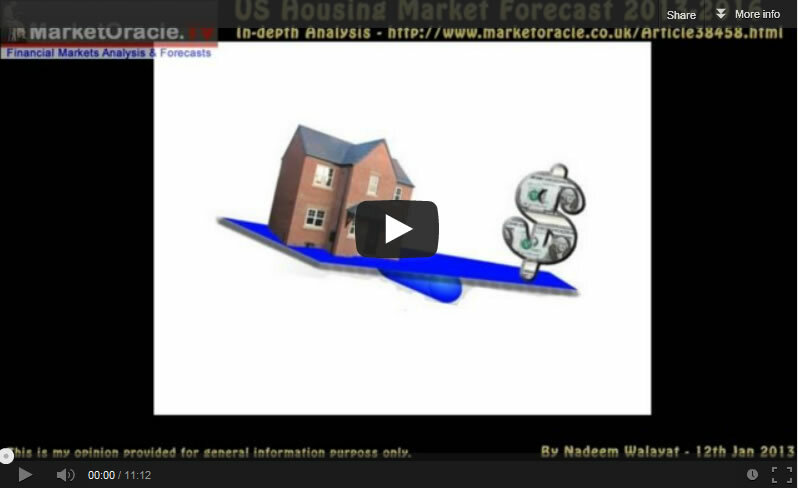 At the same time highly vocal commentators such as Peter Schiff where strongly bearish on the prospects for U.S. Housing market, see his Jan 2013 video. "Prices have to fall, they are still much too high, and I think any body who is clinging to the hope that the real estate market has bottomed really should rethink those assumptions" - Peter Schiff - Jan 2013. And as far I can see has remained bearish for the duration of the U.S. housing bull market since. Now don't take this as me picking on Peter Schiff for he just represents the prevalent consistent consensus view that has been regurgitated at length on the likes of CNBC that most retail investors have been exposed to, so it is no wonder that most tend to miss whole bull markets only finally joining in when its actually time to get out. My in-depth analysis and concluding trend forecast was shortly followed by a video version in Mid Jan 2013. My U.S. housing market outlook for 2014 was updated in early January ahead of inclusion in my new housing markets ebook (FREE DOWNLOAD) that expected a sharp slowdown in U.S. house price inflation during 2014 as I expected U.S. house prices to converge towards my forecast trend trajectory. The latest data for October 2013 confirms my view that the U.S. housing market is going to be experiencing a severe slowdown in momentum during 2014 as the inflation rate drops from about 15% early 2014 to probably under 7% towards its end. This is in the context of my over-riding 3 year forecast of Jan 2013 to early 2016 as U.S. house prices look set to converge towards the forecast trend trajectory during 2014. By mid 2014 the sharp slowdown in price rises will prompt many commentators in the mainstream press to proclaim that the bull market has ended, when in reality it would just represent the market laying the ground work for the next leg higher during 2015 as prices oscillate around the forecast trend. Summary for 2014 - Sharp slowdown in U.S. house prices inflation to under 7% coupled with sharp acceleration in U.S. economy to GDP 4% to 4.25%. Your analyst warning you not to pay any attention to the bubble talking fools during 2014, all of whom never saw this bull market coming and thus will continue to remain in a permanent state of denial just as they have been towards the stocks stealth bull market of the past 6 years. Understand this - we won't see a bubble peak in U.S. house prices for many more years. The updated halifax average house prices (NSA) graph to July 2014 of £189,726 is set against the forecast index level for July 2014 of £188,244 which illustrates that house prices over the past 7 months have shown <1% deviation from the forecast trend and therefore the long-term trend forecast remains on track to achieve a 55% rise in average house prices by the end of 2018. My article of June 2014 concluded that house prices momentum was expected to continue to accelerate over the summer months and therefore to result in a slightly above trend forecast trajectory which is coming to pass with UK house prices not expected to deviate much further beyond +1% from forecast before converging towards trend forecast as I continue to expect UK house prices to OSCILATE around the forecast trend, and implying a slowdown towards trend -1%. The western media propaganda remains largely perplexed as to how ISIS has apparently so quickly taken hold of such a large area of territory in first Syria and now Iraq. However, the reason why is no different then what would take place in any area of the globe where law and order has been extinguished because the Islamic State is not operated along ISLAMIC principles as understood by 99% of those why subscribe to Islam, but rather Mafia CAPITALIST principles that fills the void left by the extinction of law and order, because as the Islamic State maps tend to suggest that its attacks are CAPITALIST in nature for they seek revenue generating resources such as oil wells, energy production facilities, dams, agricultural land and concentrated pools of population to either TAX or LOOT. So rather than religious they are more a Mafia money making criminal enterprise, which ironically suggests that this is essentially what Islam was when it first began its initial explosive expansion, seizing territory and resources IS style. When you realise the Islamic State is a Mafia money making crime syndicate you soon realise that its power and reach has been vastly over exaggerated by the West for its own geopolitical objectives as I elaborated upon in Mid June ( ISIS Crisis Only Tip of the Sunni Ice-berg in Iraq), because just as is the case with the real mafia, most of those who fight under the ISIS banner are just associate members who's allegiances are more of convenience for stealing wealth and gaining power than ideology. In terms of Geopolitics, it was not so long ago that the likes of Senator John McCain was advocating arming the likes of Islamic (Mafia) State to fight Syria's Al-Assad, now the U.S. is flip flopping towards supporting Al-Assad against Islamic (Mafia) State. “I believe there are ways to get weapons to the opposition without direct United States involvement. “So I am not only not opposed, but I am in favor of weapons being obtained by the opposition,” - John McCain. The truth for the media blitz focus on an over exaggerated Islamic State that it paints as being a state when it is nothing of the sort, all to distract the worlds eyes from Israel's war on Gaza, the jewish fundamentalist states slow burn genocide of the palestinian people which has now reached over 2,000 killed and remains on track to reach the 4,000 murders this year alone, as I warned of in early July. In Britain the mainstream media has been obsessed with over exaggerating the number of young British muslims going over to fight for the Islamic (Mafia) State, in a future article I will explain the real reason why 99.9% of British muslims will never support the Islamic (Mafia) State, and you will be surprised at the reason why. Today the name of the enemy may be ISIS / Islamic State but the U.S. / Israel strategy has remained constant for decades which is for the breakup of nation states such as Iraq, Syria and Iran into warring mini states so that the U.S. and Israel can continue to dominate the region, we see that today with the U.S. using the ISIS back door into Syria and for sponsoring the break up of North Iraq, Iran and East Turkey into Kurdistan, THAT IS THE BIG PICTURE! ISIS is a temporary smoke screen for they will soon be replaced with a new bogeyman, just as Al-Assad was yesterdays and Saddam the day before. So don't be surprised if a couple of months down the road we are watching U.S. armed Kurdistan waging war on parts of Turkey and Iran as it attempts to carve out greater Kurdistan. EWI have made available to our readership their valuable learning resources for FREE enabling you to learn how to spot high-confidence trade setups in the charts you follow every day from now until Wednesday, August 27. How? By watching free video lessons from Jeffrey Kennedy, Chartered Market Technician and Senior Instructor at Elliott Wave International (EWI). To be a consistently successful trader, the most important trait to learn is emotional discipline. I discovered this lesson the hard way trading full-time a few years ago. I remember one day in particular. My analysis told me the NASDAQ was going to start a sizable third-wave rally between 10:00-10:30 the next day ... and it did. When I reviewed my trade log later, I saw that several of my positions were profitable, yet I exited each of them at a loss. My analysis was perfect -- it was like having tomorrow’s newspaper today. Unfortunately, I wanted to hit a home run, so I ignored singles and doubles. I now call this emotional pitfall the “Lottery Syndrome.” People buy lottery tickets to win a jackpot, not five or 10 dollars. It is easy to pass up a small profit in hopes of scoring a larger one. Problem is, home runs are rare. My goal now is to hit a single or double, so I don’t let my profits slip away. Inability to Admit Failure Have you ever held on to a losing position because you “felt” that the market was going to come back in your favor? This is the Inability to Admit Failure. No one likes being wrong, and, for traders, being wrong usually costs money. What I find interesting is that many of us would rather lose money than admit failure. I know now that being wrong is much less expensive than being hopeful. Fear of Missing the Party Another emotional pitfall that was especially tough to overcome is what I call the Fear of Missing the Party. This one is responsible for more losing trades than any other. Besides overtrading, this pitfall also causes you to get in too early. How many of us have gone short after a five-wave rally just to watch wave five extend? The solution is to use a time filter, which is a fancy way of saying wait a few bars before you start to dance. If a trade is worth taking, waiting for prices to confirm your analysis will not affect your profit that much. Anyway, I would much rather miss an opportunity than suffer a loss, because there will always be another opportunity. This emotional pitfall has yet another symptom that tons of people fall victim to: chasing one seemingly hot market after another. To avoid buying tops and selling bottoms, I have found that it’s best to look for a potential trade where (and when) no one else is paying attention. Systems Junkie My biggest emotional monster was being the Systems Junkie. Early in my career, I believed that I could make my millions if I had just the right system. I bought every newsletter, book and tape series that I could find. None of them worked. I even went as far as becoming a professional analyst -- guaranteed success, or so I thought. Well, it didn’t guarantee anything, really. Analysis and trading are two separate skills; one is a skill of observation, while the other, of emotional control. Being an expert auto mechanic does not mean you can drive like an expert, much less win the Daytona 500. I am not a psychologist or an expert in the psychology of trading. These are just a few lessons I’ve learned along the way ... at quite a cost most times. But if you are serious about trading, I strongly recommend that you spend as much time examining your emotions while you are in a trade as you do your charts before you place one. What you discover may surprise you. Join Jeffrey Kennedy for Trader Education Week, a FREE trading event that will teach you how to spot trading opportunities in your charts. From now until August 27, you can view free video trading lessons that you can apply to your trading immediately -- from EWI's popular service, Trader's Classroom.